What happens when you think you have it all, and then suddenly it’s taken away? Willa Chandler-Golden's father changed the world with his self-help bestseller, Is It Really Your Choice? Why Your Entire Life May Be Out of Your Control. Millions of devoted fans now find solace in his notion that everything happens for a reason. Though Willa isn’t entirely convinced of her father’s theories, she readily admits that the universe has delivered her a solid life: a reliable husband, a fast-paced career. Sure there are hiccups – negative pregnancy tests, embattled siblings - but this is what the universe has brought, and life, if she doesn’t think about it too much, is wonderful. Then her (evidently not-so-reliable) husband proposes this: A two-month break. Two months to see if they can't live their lives without each other. And before Willa can sort out destiny and fate and what it all means, she’s axed from her job, her 12 year-old nephew Nicky moves in, her ex-boyfriend finds her on Facebook, and her best friend Vanessa lands a gig writing for Dare You!, the hottest new reality TV show. And then Vanessa lures Willa into dares of her own - dares that run counter to her father’s theories of fate, dares that might change everything…but only if Willa is brave enough to stop listening to the universe and instead aim for the stars. Allison Winn Scotch has just such a wonderfully beautiful way of describing every day life and events and making them almost musical and gorgeous. I wish I could describe her book in such a way that emulates her amazing writing skills because I am truly in awe of the way she writes. 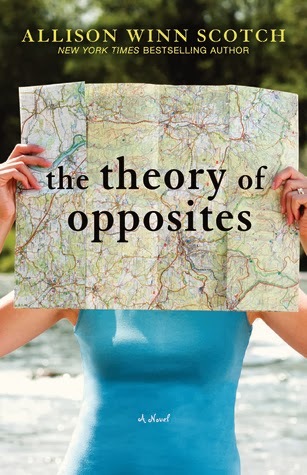 The Theory of Opposites spoke to me deeply and not just because I enjoyed hearing about Willa and how she decided to live her life. I was already a fan of this author's but I can definitely say that this book cemented my love for her writing and in fact, I stayed up super late one night to finish the book as I couldn't put it down. And that is something I probably shouldn't have done as I have a young baby but this book is just THAT GOOD. Willa was just such a dork at times, definitely NOT self-assured and reminded me a lot of myself at times. I would never have thought I didn't do exactly what I wanted when I wanted to but this book made me reflect, and I was shocked to discover that, like her, I was somewhat a victim of inertia. The not typical love story (or perhaps stories) in this book also made my heart cheer. I was not expecting some of the totally romantic things that happened or were said, and not just with her, but it made me very much want to challenge the status quo. So there you have it - a wonderful main character, a great plot with fantastic descriptions and dialogue, plus a book that challenged me. A recipe for an incredible read! Thank you to Camellia Press for our review copy. All opinions are our own.